The International Turnaround Management Standard (ITMS) honors John M. Collard as a Significant Contributor to the development of the standard. The Turnaround Management Society has developed the ITMS and is overseeing its certification process. The ITMS is a guided system through a corporate turnaround based on over 1500 references, countless interviews and over 150 turnaround cases. It is applicable to virtually any situation and industry targeting the most common reasons why turnarounds fail while utilizing the success factors and strategies that led to successful turnarounds over the past 30 years. The International Turnaround Management Standard is published as a book authored by Dr. Christoph Lymbersky who led the research project. It serves as the Turnaround Management Body of Knowledge (TMBoK) for the Turnaround Management Society and all its classes to obtain certifications in Turnaround Management. It can be obtained in bookstores worldwide, from Amazon, B&N, books.com, Libri and from the Turnaround Management Society directly. "Corporate restructurings often follow no method or standard. Turnaround managers often only have a legal background or a purely financial or accounting background, which leave them without the whole strategy," said Dr. Christoph Lymbersky, Executive Director of Turnaround Management Society, and author of the International Turnaround Management Standard. "Troubled companies have more problems in the areas of strategy, operating, marketing, and management failure. I wanted to provide a guided method, to turnaround around a company that got into a crisis situation. A method that does not solely focus on one particular area of distress, but treats all causes for the crisis in a structured and controlled way. Our method is the ITMS." John M. Collard, Chairman, Strategic Management Partners, Inc., Past Chairman, Turnaround Management Association, and Chairman, Association of Interim Executives, said "I am honored to part of such a fine work. Turnarounds are like beginning over again – they must build teams, differentiate and sell products and services, secure capitalization, and grow." Collard continued. "The situation and players in each turnaround engagement are unique, which requires flexibility and creativity in approach to succeed. 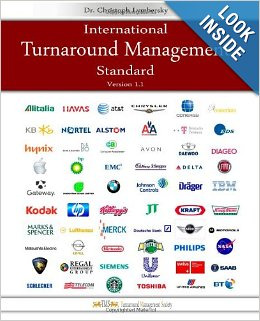 The International Turnaround Management Standard is a brilliant rendition of strategies and actions that can be applied to the turning process. Dr. Lymbersky has done a marvelous job bringing together methodologies for practitioners." John M. Collard is a Certified Turnaround Professional (CTP), and a Certified International Turnaround Manager (CITM), who brings 35 years senior operating leadership, $85M asset and investment recovery, 45+ transactions worth $780M+, and $80M fund management expertise to run troubled companies, serve on boards, advise company boards, litigators, institutional and private equity investors, and raise capital. John has parachuted in as the Interim CEO or senior executive to turn around a troubled entity, and serves as an outside director. John is Chairman of Strategic Management Partners, Inc. (410-263-9100, www.StrategicMgtPartners.com ) in Annapolis, Maryland, USA. John is inducted into the Turnaround Management, Restructuring, and Distressed Investing Industry Hall Of Fame, Past Chairman of the Turnaround Management Association (TMA), Chairman of the Association of Interim Executives (AIE), and Senior Fellow of the Turnaround Management Society (TMS). Strategic Management Partners, Inc. (www.StrategicMgtPartners.com 410-263-9100) is a turnaround management firm specializing in interim management and executive CEO leadership, asset and investment recovery, corporate renewal governance, board and private equity advisory, raising capital, and investing in distressed underperforming troubled companies. The firm has been advisor to Presidents Bush (41 & 43), Clinton, Reagan, and Yeltsin, World Bank, EBRD, Company Boards, and Equity Capital Investors on leadership, governance, turnaround management and equity investing. SMP is celebrating 25 years of service to its clients. SMP was named Maryland's Small Business of the Year, and received the Governor's Citation, Governor Martin J. O'Malley, The State of Maryland as a special tribute to honor work in the areas of turning around troubled companies and saving jobs in Maryland. Turnarounds & Workouts Magazine has twice named SMP among the 'Top Outstanding Turnaround Management Firms'. American Business Journals named SMP among the Most Active Turnaround Management and Consulting Firms in Baltimore, Washington, and the Mid-Atlantic Region. Global M&A Network Turnaround Atlas Awards named SMP as Boutique Turnaround Consulting Firm of the Year . SMP is 2012 winner of Corporate Intl Magazine Global Awards for Interim Management Specialist Firm of the Year in Maryland and Management Consulting Advisory Firm of the Year in Maryland. SMP is 2013 winner of Acquisition Intl Magazine 'Turnaround Management Firm of the Year' Award. Strategic Management Partners, Inc.: turnaround managers ready to run troubled companies, recover assets from investments gone bad, advise boards of directors and investors on company viability in distressed situations. We provide strong interim and operational leadership, strategic planning, financial, defense conversion, sales and marketing acumen developed building organizations in large and small companies, including President of public & private middle-market companies providing solutions to Commercial, Federal, International markets. Enterprises range from start-up to $100+mil. Industry expertise: Manufacturing; Job Shop; Engineering Services; Defense Electronics; Aerospace; Federal Government Contracting; Systems Integration; High-Tech; Computer Processing/Services/Software/Integration; Communications; Finance; Marine Services; Real Estate Development; Construction; Fabrication; and Printing. The TMS is an industry specific organization for Turnaround Management. Its members are turnaround professionals, distressed debt investors and academics. It is the objective of the TMS to bring together the knowledge of Turnaround Management academics and the experience of Turnaround Management professionals. The TMS provides a link between academics who are engaged in research and the professional community that seeks research outcomes and provides academics with professional insight, guidance and feedback. The TMS supports the International Turnaround Management Standard™ (ITMS), the Successful Turnaround Management Strategies Database, the Turnaround Management Journal (TMJ), and TMS Certifications.